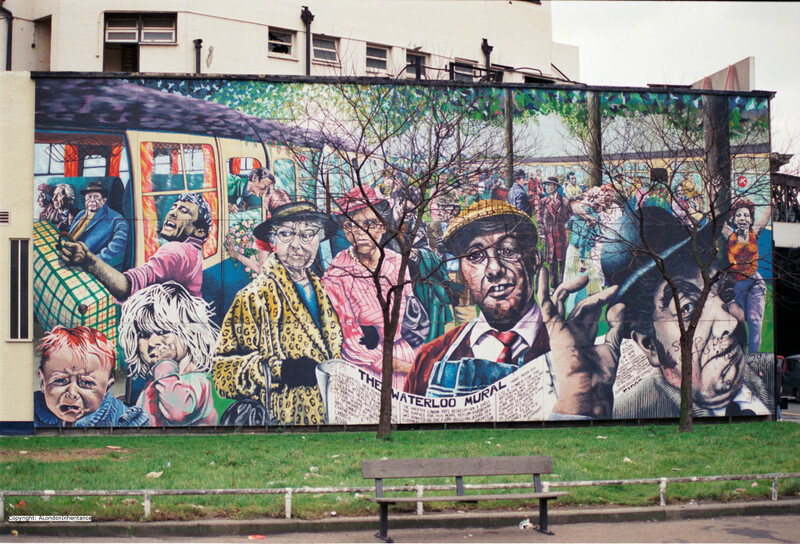 In the 1980s there was a growth in the amount of murals and street art across London, a mix of decoration or serious and politically inspired. These photos were taken in 1985 and 1986 and demonstrate not only considerable skill and effort but many also reflect the social and political concerns of the time. 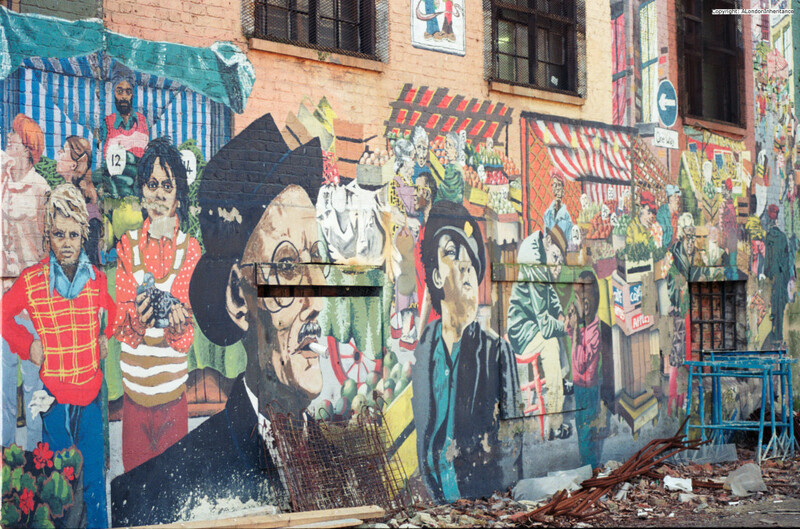 Some of these murals still exist, however they are now much faded. These photos show them shortly after completion with their detail and vibrant colours. The following picture shows Greenwich Park, the Queens House and the Royal Observatory in the centre with the Thames curving past the Isle of Dogs which is to the left. Above and below is a horrific scene of missiles falling onto the population of London, presumably with the aim of destroying the people and the city. Starting from the mid 1980’s, the Cold War was coming to a gradual end, concluding a period when nuclear annihilation had been a real possibility, which this work probably represents. Many of the people are holding hands around the vision of London, their outstretched arms appear to be hitting out at the missiles. A representation of people power against the nightmare of nuclear war? And note the fine example of a 1980s car in the foreground, a Ford Capri. 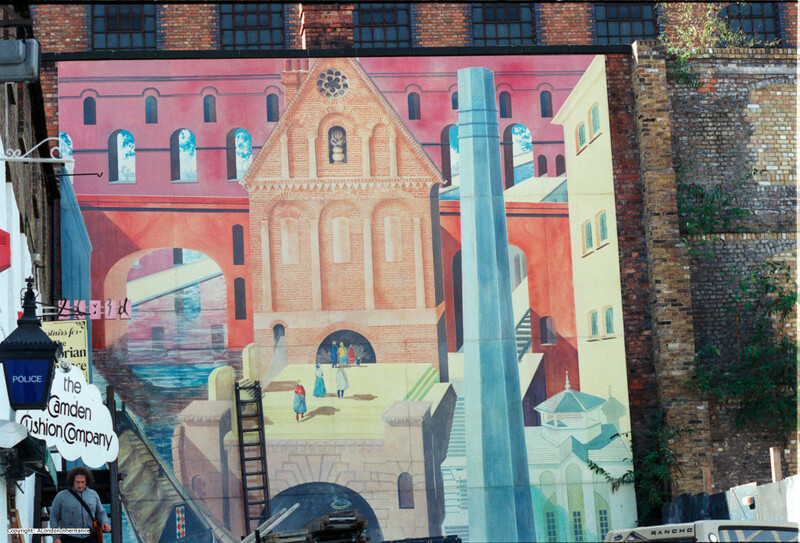 The following was painted in 1985. The lettering top right of the smaller picture states that this was GLC funded. The GLC (Greater London Council) was dissolved in 1986 following the Local Government Act of 1985. The TV is showing a picture of Margaret Thatcher. It was mainly the conflict between Ken Livingstone’s policies at the GLC with the Conservative government led by Margaret Thatcher that led to the abolition of the GLC. 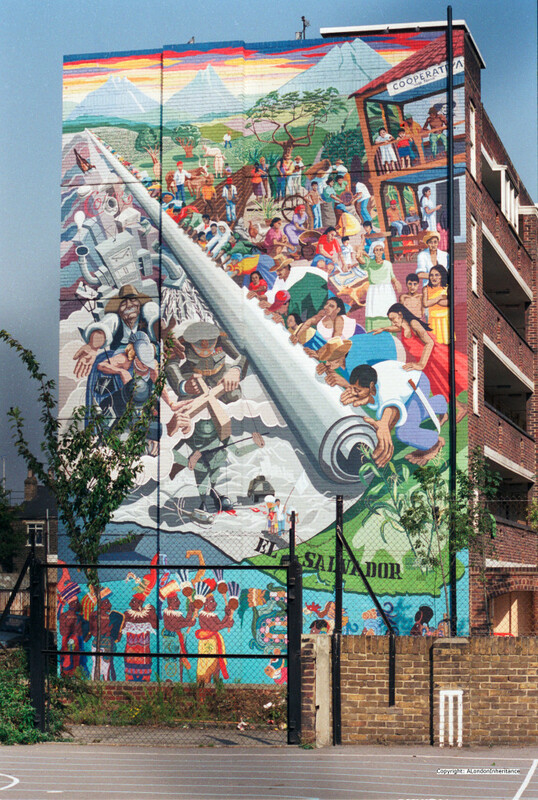 The following mural shows El Salvador in Latin America. A country that was going through considerable violence and turbulence throughout the 1980s following a coup d’état in 1979. 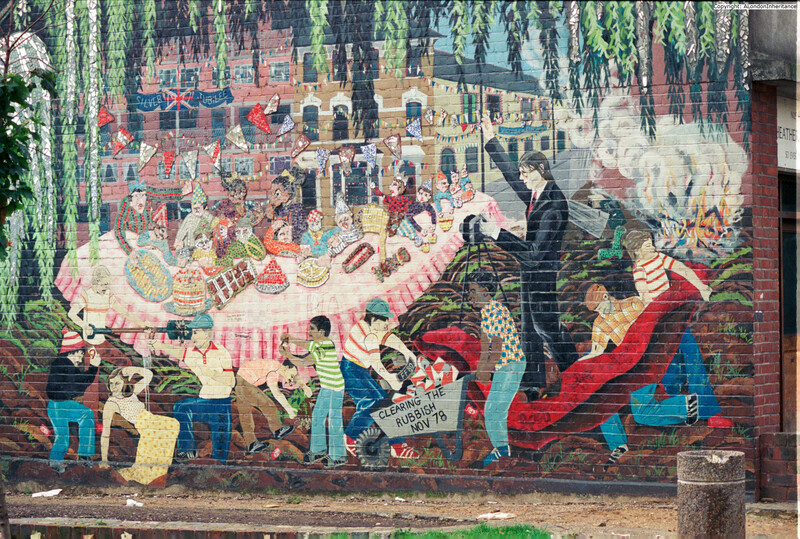 The mural appears to represent the idyllic cooperative movement rolling back the military and industrial complex back into the sea. 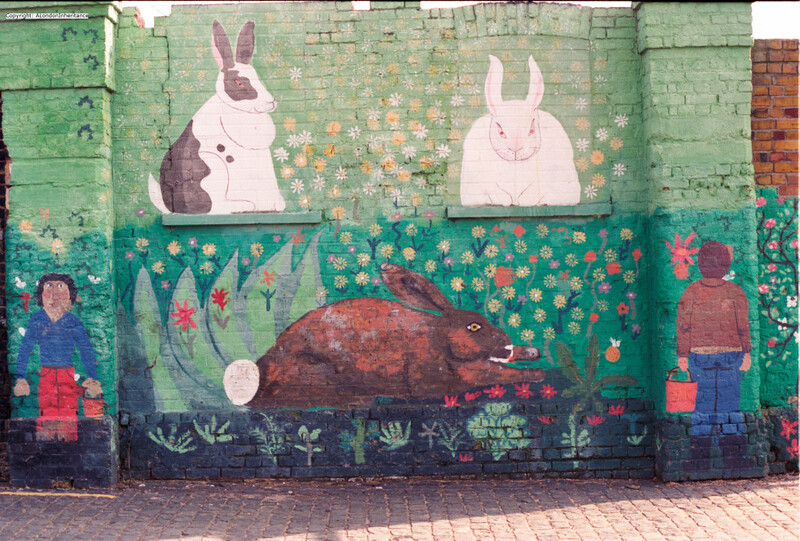 The mural is still there, although much faded. 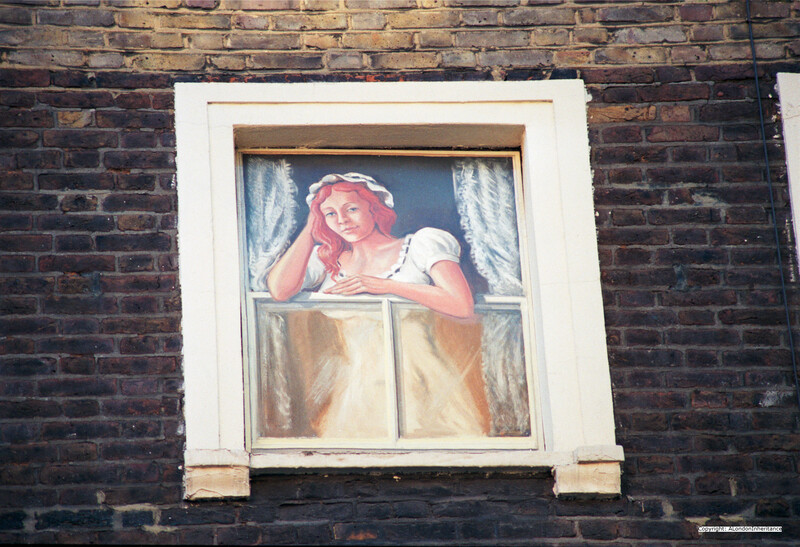 The location is the side of Macey House, Horseferry Place, Greenwich. The following picture seems to cover a number of events. A street party with a banner referring to the Silver Jubilee in the background. In the background to the right is a banner referring to Victory in Europe, probably referring the previous street celebrations. Street market, Wentworth Street in E1. 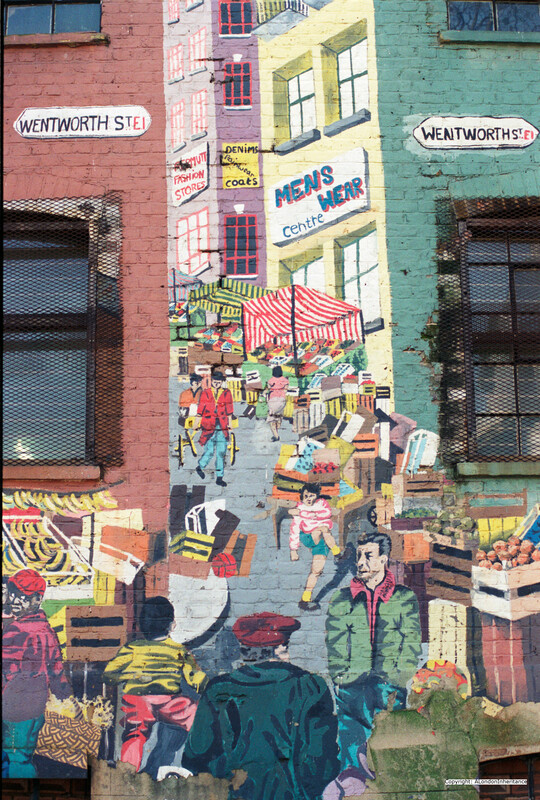 The Waterloo Mural near Waterloo Station. 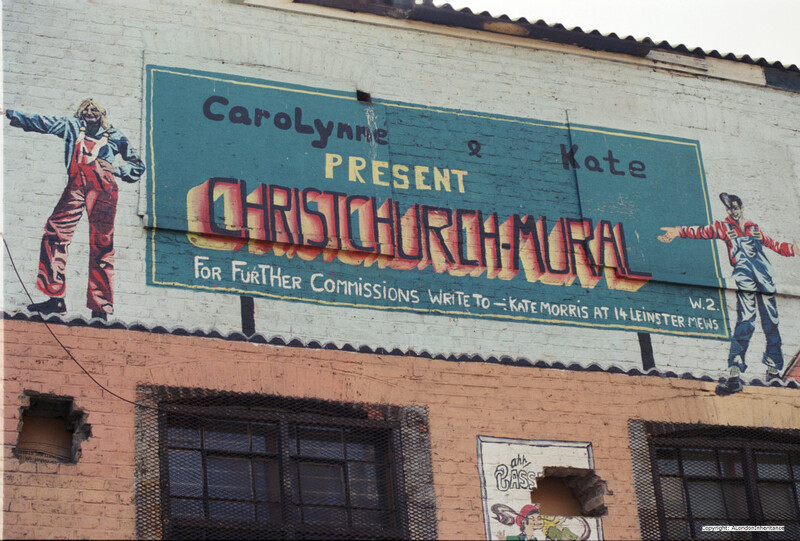 The detail on the newspaper identifies this as completed on the 20th October 1980 by Carolynne Beale and Cat… (rest hidden behind the tree) of Murals Unlimited. Could this be the same people as Carolynne and Kate? 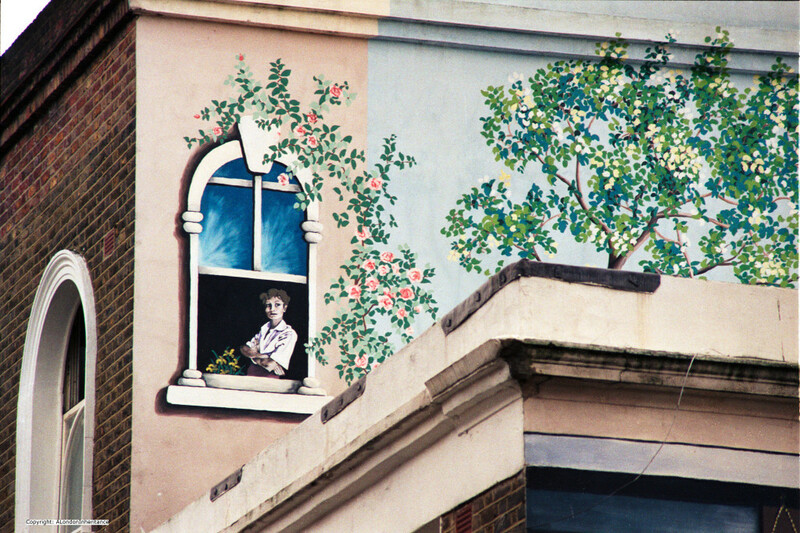 Fantastic artwork on the side of a house in Wolsey Road in Islington. This is still in place although a large tree has now grown in the garden in front and covered most of this work. I suspect that this period was a peak for this type of street artwork. Walking around London now, I do not see very much contemporary work and there is certainly very little that has the same political inspiration as that created during the 1980s. This entry was posted in London Streets on June 22, 2014 by admin. 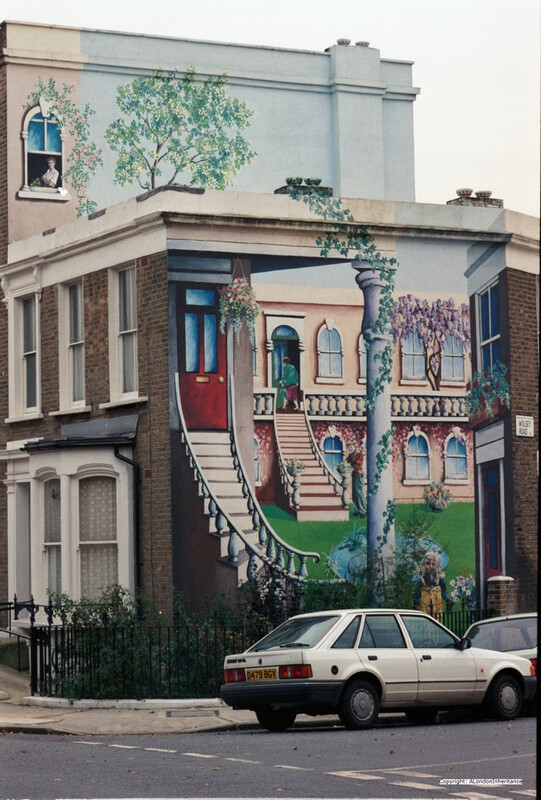 Thanks for your interesting work on London murals. Would you happen to know where the one showing Greenwich Old Royal Naval College and the Ford Capri might be? I am a local resident and cant remember where this is. 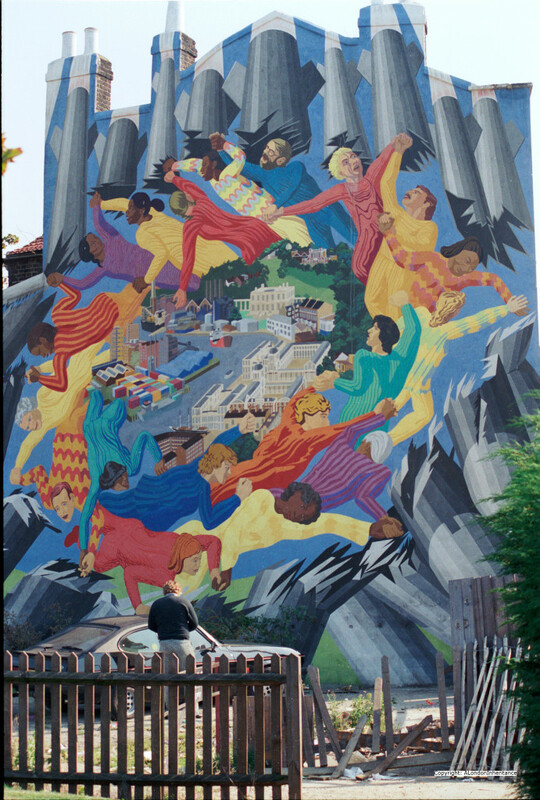 I’m delighted to see a photo of the mural in Wolsey Road, Islington. 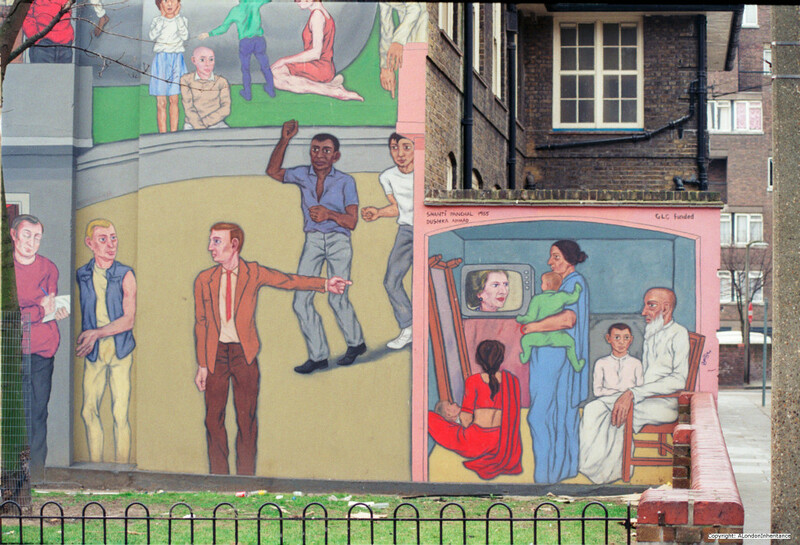 I knew two of the people depicted in the mural (though not the child) and it’s great to know the mural still survives.